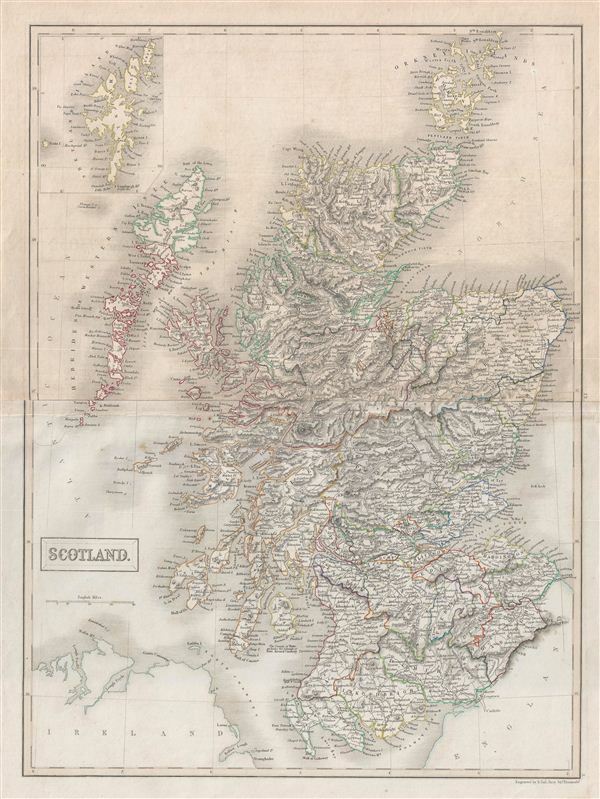 A fine example of Adam and Charles Black's 1840 map of Scotland. The map covers Scotland from the Orkney Islands to Wigton in the South inclusive of the Hebrides. An inset on the top left corner details the Shetland Islands. In 1843, against the backdrop of the Industrial Revolution, during which Scotland flourished, the Church of Scotland witnessed a division in which many of its ministers, following a decade long conflict, broke away to form the Free Church of Scotland. This map was engraved by S. Hall for issue in the 1840 edition of Black's General Atlas. Very good. Blank on verso. Original platemark visible. Original centerfold. Printed on two sheets joined by published - unequal toning. Rumsey 2305.019 (1854 edition). Philips (atlases) 4334.